More and more cruise lines are adding restaurants where access is limited solely to guests staying in the ship's suites. Cunard's Grills, the MSC Yacht Club, The Haven on Norwegian's larger ships, and Celebrity's Luminere restaurants are all examples. The purpose of these restaurants is to enhance the cruising experience of the guests staying in the suites by providing an exclusive dining venue that is beyond the experience offered in the ship's main dining rooms. Coastal Kitchen, which premiered on Quantum of the Seas, is Royal Caribbean International's entry into this field. It is not a copy of Cunard's Grills nor of Norwegian's Haven, but rather an experience in tune with Royal Caribbean's style of cruising. It is not formal nor is it urban chic, rather it is a relaxed atmosphere with premium food. The restaurant's décor recalls a California wine cellar. Three of the walls are covered with brick facing and faux wood wine racks. The fourth wall is floor-to-ceiling windows, which allow in natural light and since the restaurant is high on Deck 14, provide panoramic views. Like the décor, the food is California-influenced. Royal Caribbean calls it a “fresh fusion of California cool and Mediterranean inspired taste.” The dishes are straight forward without heavy sauces and lean toward the healthy side of the spectrum. Coastal Kitchen is open for breakfast, dinner and lunch (on most sea days). The lunch and dinner menus are very similar and do not change over the course of the cruise. For breakfast, Coastal; offers a wide assortment of dishes ranging from cereals and yogurt to egg dishes to “everyday favorites” such as French Toast and pancakes. The servers bring around a selection of pastries, muffins, croissants and Danishes. We particularly enjoyed the fresh-squeezed juices, particularly grapefruit juice which we could not find elsewhere on the ship. Another outstanding item was the home-made muesli. You can customize the muesli from a selection of toppings including walnuts, dates, raisins, berries and coconut. All of these topping are brought on a tray by the server and you simply point to the ones you want. Turning to lunch/dinner, we liked the Serrano ham wrapped dates appetizer. The sweetness of the dates contrasted with the saltiness of the ham. Ricotta cheese added both a different flavor and a variation in the texture. 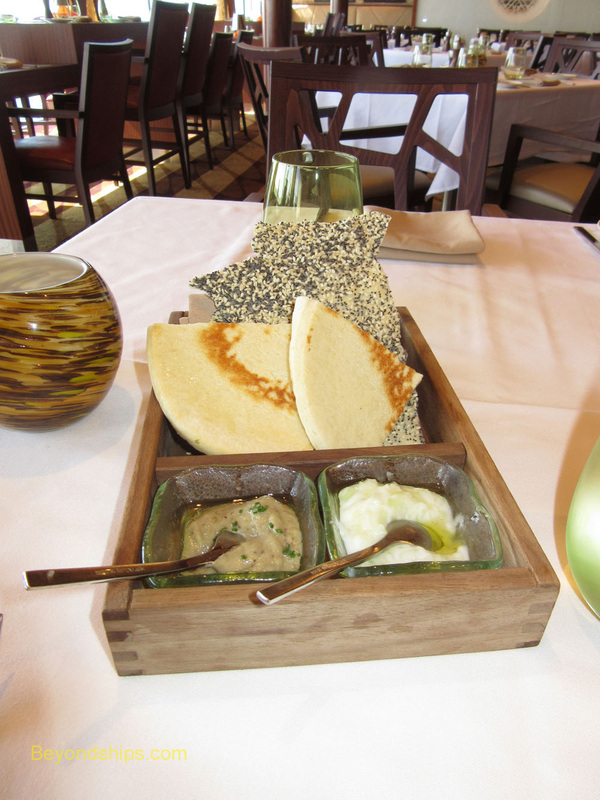 Coastal Kitchen also offers a number of flatbreads. These are wager thin and are served on a wooden block. Our favorite was the fig and prosciutto, which is offered only on the dinner menu. Here again was a variety of contrasting flavors. All of the lunch/dinner entrees we tried were quite good. The roasted rack of lamb is very popular with the guests. However, we were most impressed by the pan-seared Atlantic salmon. Cooked with the skin attached, it was moist and flavorful. Personalized service is the norm. The servers were friendly and quickly came to know the guests' preferences. 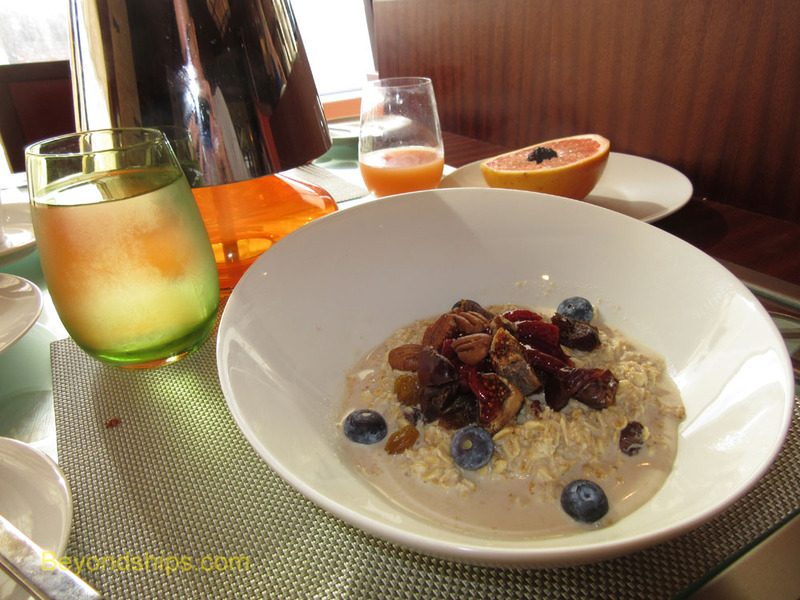 Above: Customized muesli is one of the breakfast options. Below: Fig and prosciutto flatbread. Above: Pan Seared Atlantic Salmon. Below: Replacing dinner rolls at lunch and dinner is a tray of unusual breads and toppings.